A fun and comfortable getaway for families and friends, Mountain View Lodge is loaded with amenities and features 3 bedrooms, 3 bathrooms, and room to sleep up to 8 guests. Conveniences begin as you pull up in the paved driveway, and you'll feel right at home as you step inside to the comfortable bedrooms, cozy living areas, and fully equipped kitchen with black and and stainless-steel appliances. The outdoor spaces are also great, with multiple deck areas and access to community amenities in the Mountain Shadows Resort! 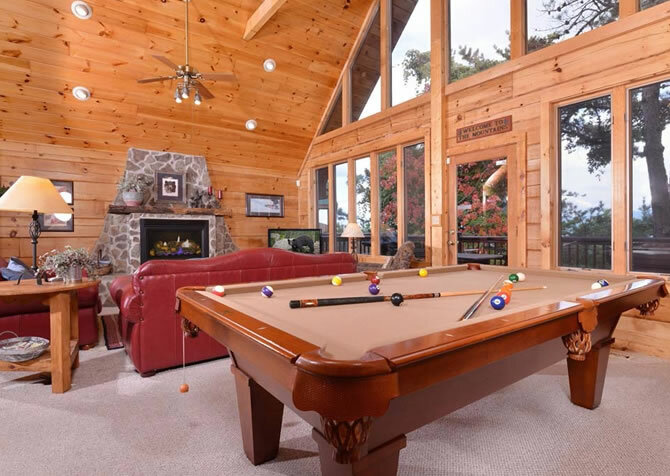 A comfortable and stylish space where family and friends can gather, play, and reminisce, the living room of Mountain View Lodge is furnished with a plush leather sofa, a cozy love seat with mountain motif, a unique trunk-style coffee table, and a TV above the fireplace. 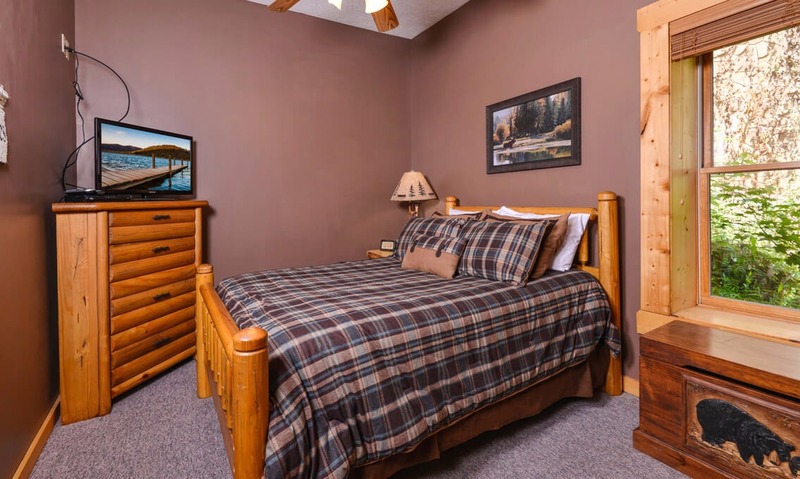 On the warm summer nights, you can flip on the ceiling fan to keep cool inside. On cool Smoky Mountain evenings, curl up in front of the gas, stone fireplace and stay warm. 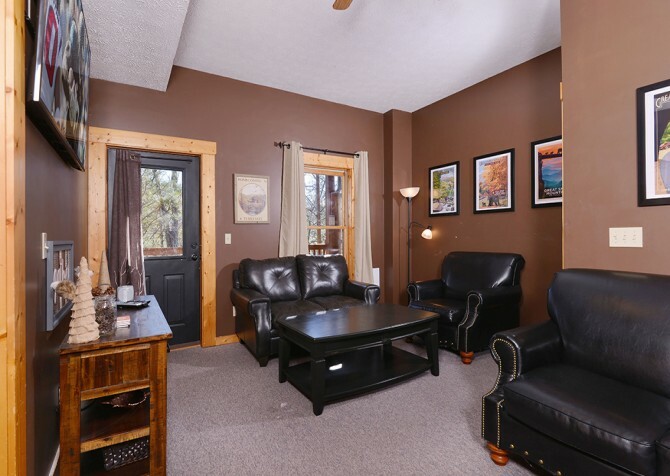 As you relax here, you can play card games or board games, watch TV and movies, and enjoy the wooded views just outside the windows. 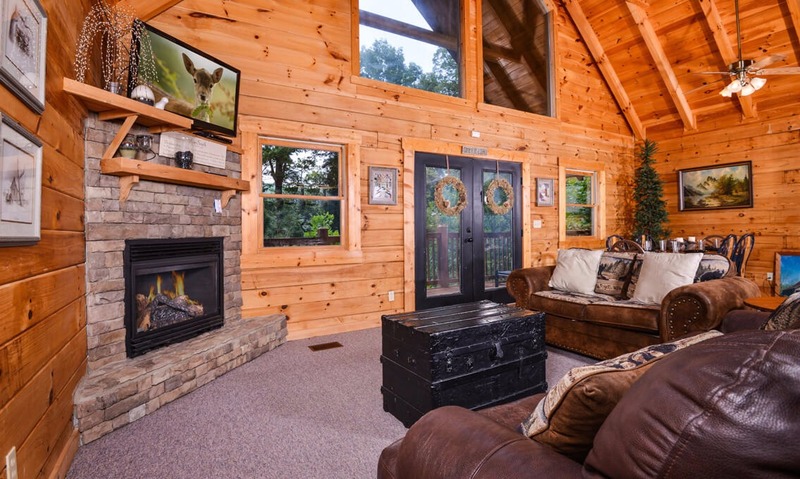 This room also features soaring ceilings with exposed wood beams that make the space feel even larger. 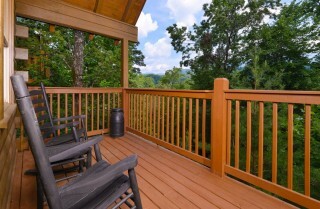 What a great place to spend some quality time in the Great Smoky Mountains! If you love to cook or just want a place to keep snacks, drinks, or leftovers during your stay, you'll appreciate having a full kitchen in the cabin. 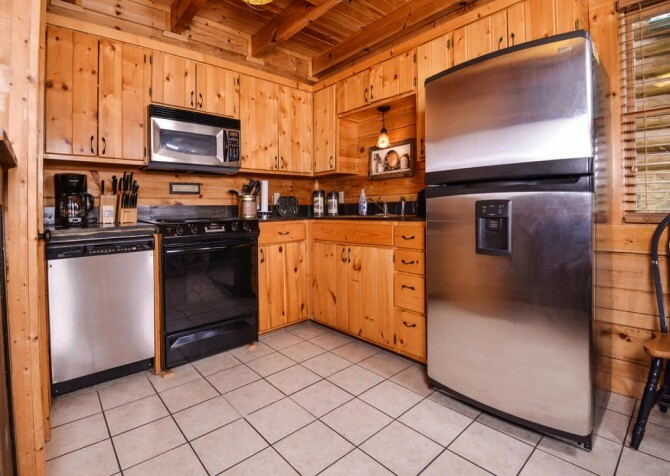 The kitchen in Mountain View Lodge is fully equipped with plenty of dishes, glassware, utensils, tools, and appliances that will make cooking in the cabin a breeze. You can keep your favorite foods in the refrigerator, run a quick load of dishes while you're out on the town, pop some popcorn for movie night, or bake some tasty treats to enjoy while you hang out around the cabin. You can grab the ingredients you need at the grocery store or local farmers market, or you can order one of our lovely gift baskets loaded with snacks and local goodies. If you love your morning jolt, try our Java Time basket and brew a fresh pot in the coffeemaker before starting your day. 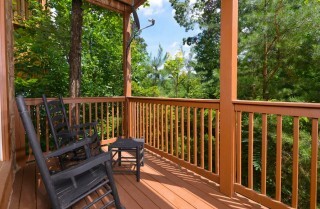 You can take your coffee out on the deck and enjoy a breath of fresh air before heading into town. After whipping up a delicious homemade meal or snack, sit down at the dining table to enjoy with the ones you love. This cozy spot between the kitchen and living room has windows that showcase the wooded views and features a dining table for 6. 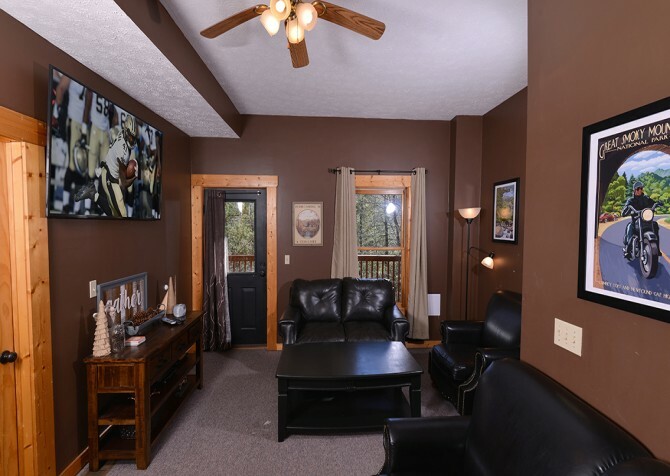 The mix of chairs offers an eclectic feel. 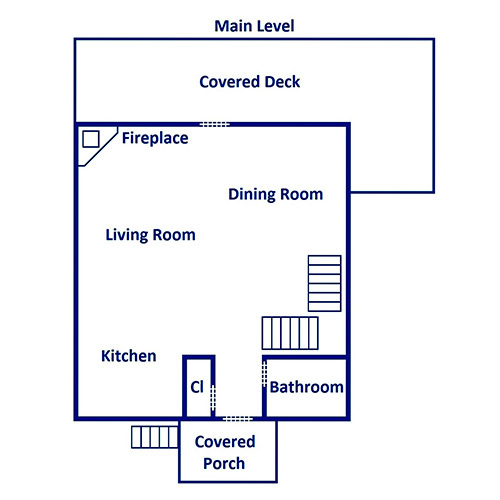 The open space allows for guests to visit while cooking, eating, and hanging out in the living room, and kids will love being able to watch their morning cartoons while having breakfast! 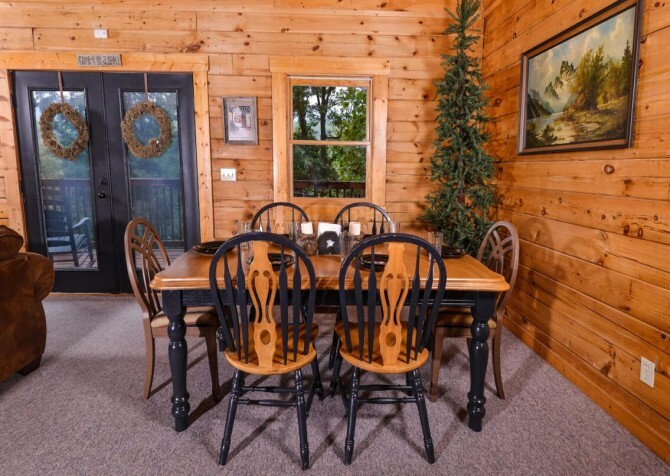 When you don't feel like eating at a restaurant downtown, this dining area will be the perfect solution. Movie night in the cabin gets an upgrade at Mountain View Lodge, where the media room is the perfect place to curl up with some popcorn, a drink, and your favorite movie. 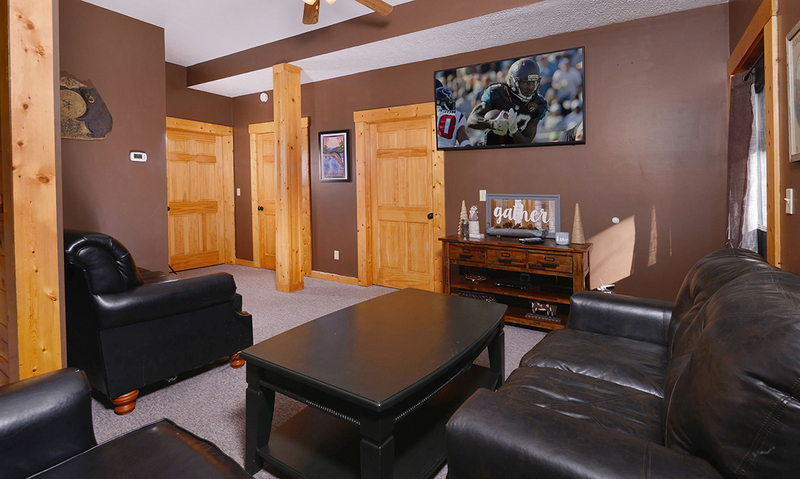 With a fresh new look, the media room features a sofa, chair, and loveseat for relaxing, along with a 65-inch smart TV and DVD player! There are even blackout curtains that give it a true movie-going experience! Each of the bedrooms in Mountain View Lodge is a comfortable and inviting space where guests can relax and get some much-needed rest. 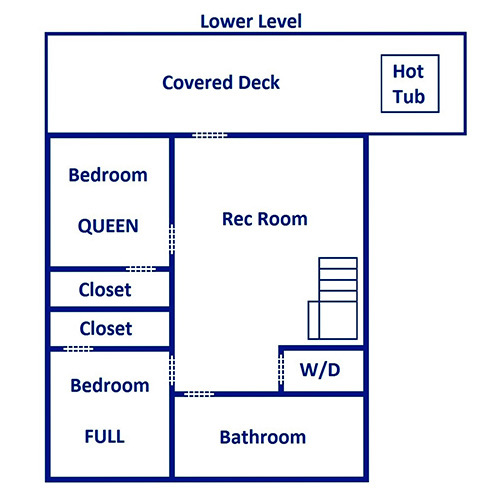 There is one king-size bed, one queen-size bed, and one full bed, along with a sleeper sofa for additional sleeping space in the cabin. 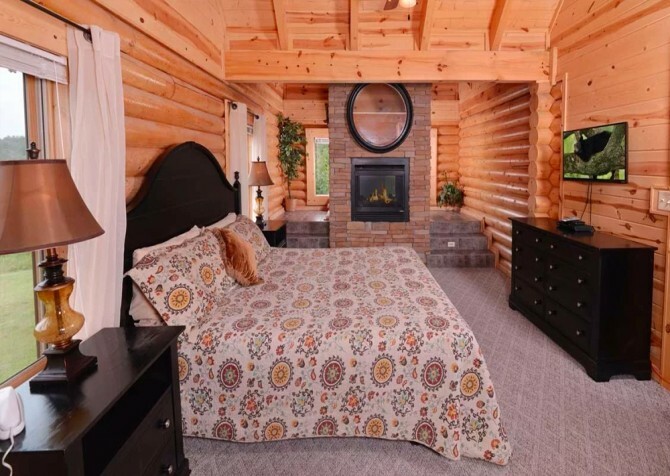 Log furniture completes the rustic yet stylish feel of the rooms, and bedside lamps offer light for late-night reading. 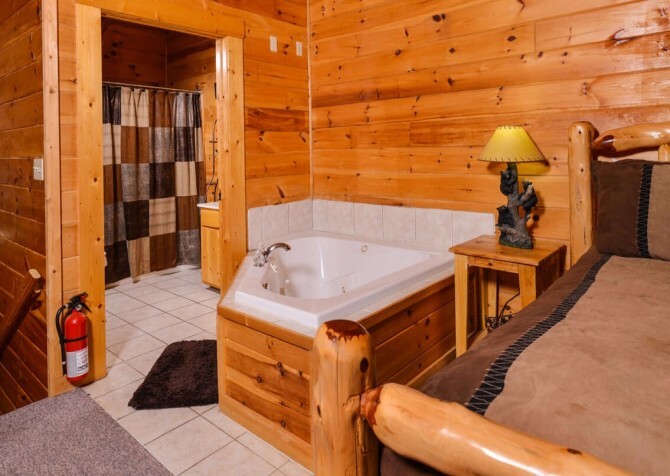 In the master bedroom, find a soothing jetted tub by the bed, a TV, and an attached bathroom. 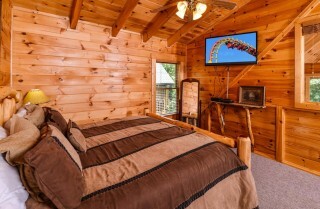 It is its own little escape in the cabin! Each room also has a window, so you won't get cabin fever while you're lying in bed. 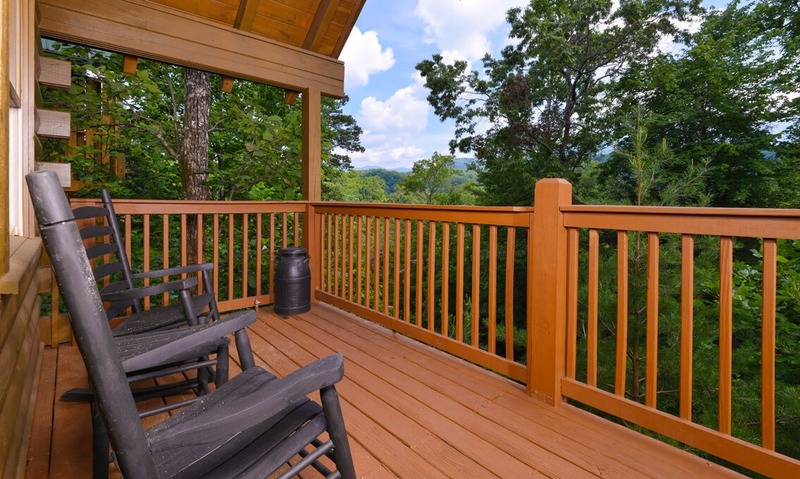 Enjoy waking up to the Smoky Mountain sunlight in the mornings! The outdoor spaces at Mountain View Lodge are just as inviting as the interiors. 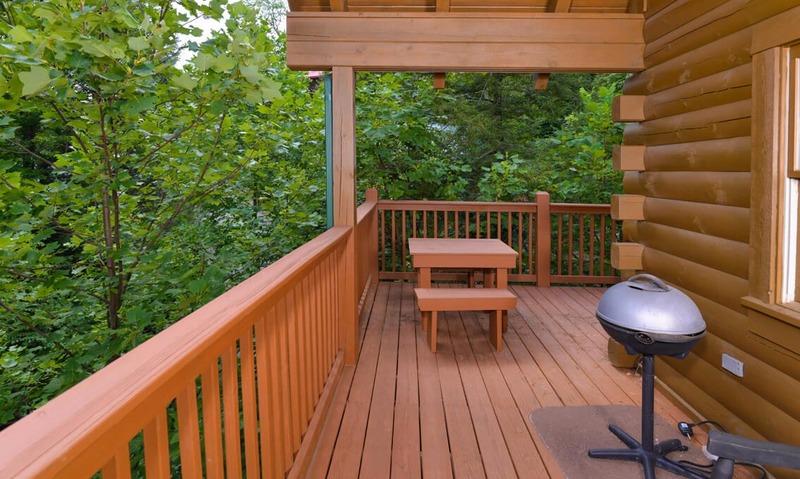 Two different deck areas offer guests separate places to enjoy the great outdoors. Have your cup of coffee in the rocking chairs on the deck, enjoy a glass of wine at the picnic table, or toss some steaks or burgers on the electric grill for a nice meal outside or at the dining table inside. 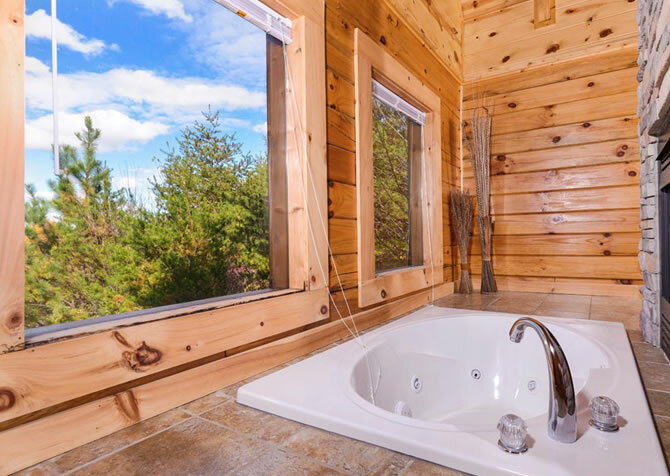 Another favorite amenity of a mountain cabin is an outdoor hot tub, and Mountain View Lodge doesn't disappoint. After a busy day exploring the attractions of downtown Gatlinburg or hiking in the Great Smoky Mountains National Park, a soak in the outdoor hot tub on the deck will be much appreciated. 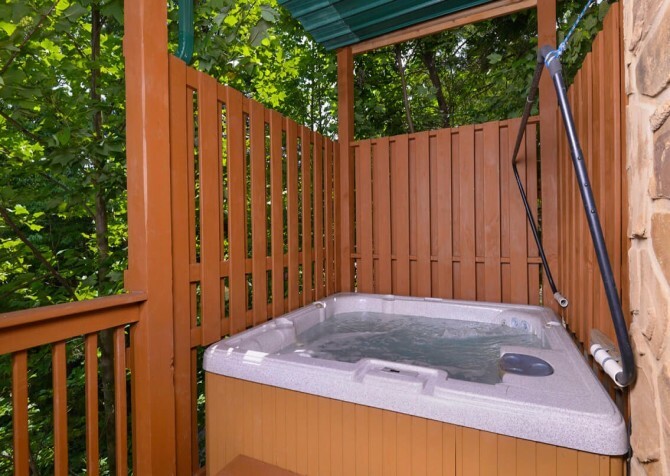 The hot tub even offers a privacy screen around most of the hot tub, so you can soak in peace. 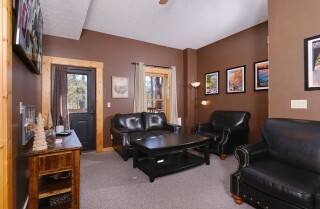 Mountain View Lodge also offers Wi-Fi, which is great for looking up area attractions and upcoming events. The washer and dryer allow you to pack light or head home with a suitcase of clean clothes, and the iron and ironing board are just two more nice conveniences. 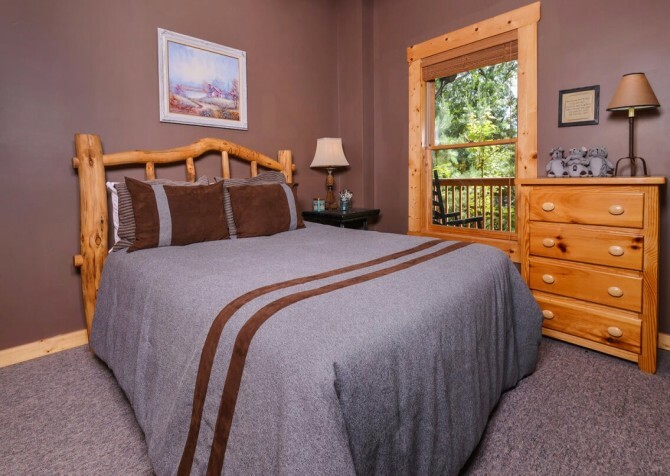 Along with the long list of amenities at the cabin, a stay in Mountain View Lodge offers guests access to community amenities in the Mountain Shadows Resort. 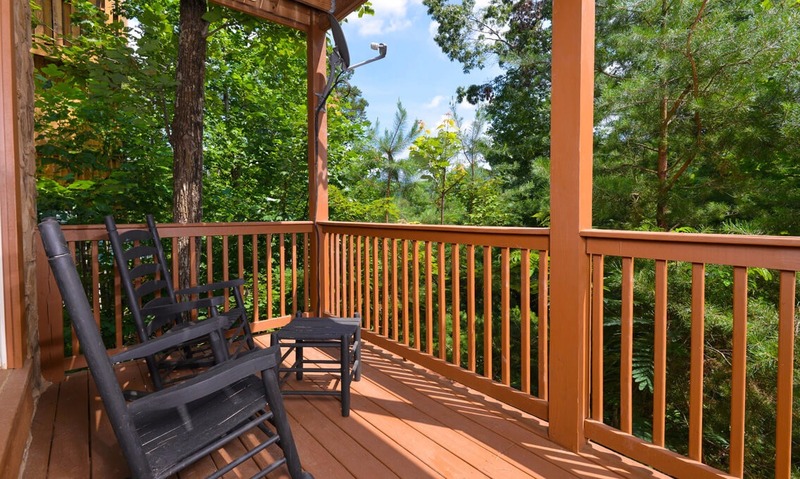 You can float in or relax by the outdoor community pool in summer, or you can enjoy the sand volleyball, swing set, or beautiful wood pavilion with seating for group gatherings. You'll enjoy that community feel in this beautiful cabin in Gatlinburg. This delicious Mexican restaurant in the heart of downtown Gatlinburg features big portions, cold drinks, and a fun atmosphere for families and friends. You can sit inside the restaurant or have a drink at the outdoor bar while people watching. Order a tall stack of pancakes, crispy bacon, and all your favorite breakfast staples at this local favorite. Breakfast is the most important meal of the day, so fill up! Located in Pigeon Forge, this fun family-friendly theme park is less than 10 miles away. It's home to some great shows that will appeal to people of all ages, along with rides for kids and adults, water rides, games, shops, and great food! "This was our first visit to Gatlinburg, and we were concerned about renting a cabin at this time of year due to the potential for poor weather. Fortunately, the weather cooperated. Even though all the roads were paved, I could see accessibility issues in really…"
"This was our first visit to Gatlinburg, and we were concerned about renting a cabin at this time of year due to the potential for poor weather. Fortunately, the weather cooperated. Even though all the roads were paved, I could see accessibility issues in really bad (icy) weather. 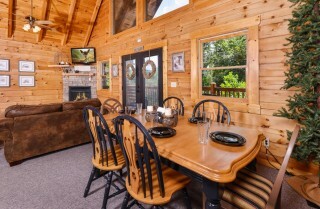 There were five adults and the cabin was a perfect size for us to spread out, yet quaint enough to allow us to comfortably gather for meals, game playing, and/or TV watching. 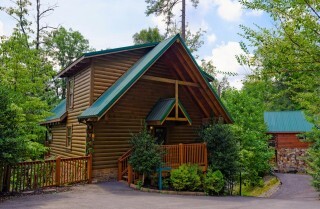 I do believe, most (if not all cabins) are supposed to have two parking spaces each. That didn't seem to be the case with this cabin as it the first one as you enter this particular cul-de-sac...so if you have more than one vehicle, you'll have to be creative. Loved the three full bathrooms and the washer/dryer. The cabin was decorated for Christmas and very inviting. We did have a burned out light bulb in the kitchen and a smoke detector in one of the bedrooms was chirping due to a dead battery, but the maintenance staff took care of these for us. Location was great, and we loved the views in the morning as well as the hot tub at night. 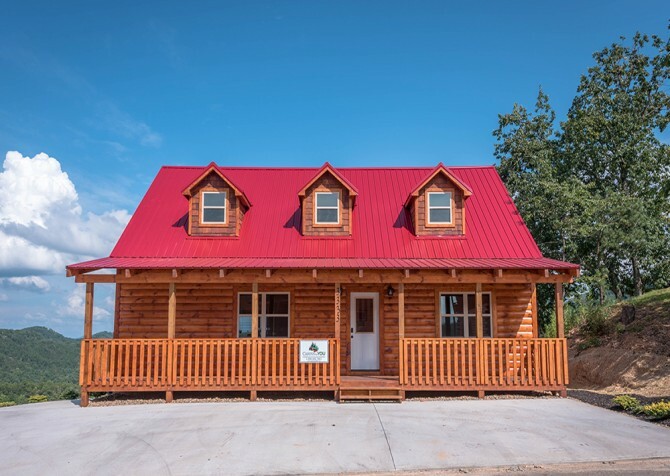 I've already recommended Cabins for YOU to all my work colleagues, and I wanted to leave feedback here to help with those who are thinking about staying." We are super glad to hear you enjoyed your stay at Mountain View Lodge — enjoying the lovely views, fun games, and bubbly hot tub! 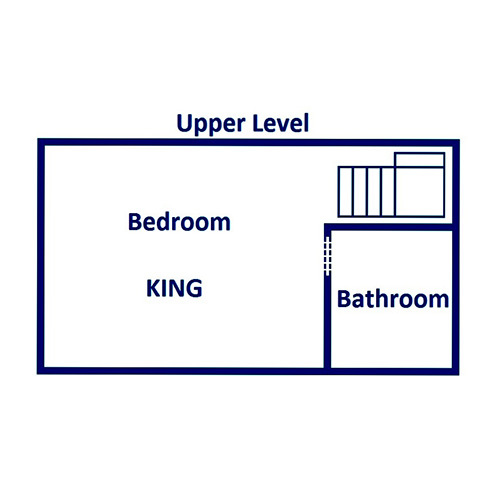 As for parking, we recommend parking at a slant, and we will update the cabin description to reflect this. Thank you so much for your feedback and for recommending us! We really appreciate it and can't wait to serve YOU again. 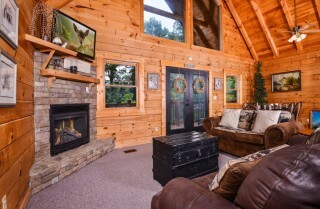 "I love Cabins for You. This is my second year renting from them. 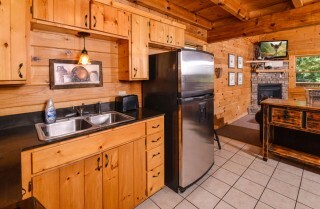 My first year we rented Creeks Edge cabin, which is an older cabin, but quaint, affordable and cute. This year, we are staying at the Mountain View Lodge in the Mountain Shadows resort. It is breathtakingly beautiful! I can't think of a better property management company. Fast, prompt, courteous and very helpful. I just had to unpack, and everything else is provided. The pride and quality of housekeeping shows as well. 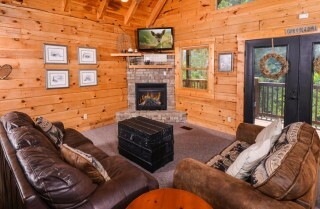 I will continue to use Cabins for You and refer friends year after year." 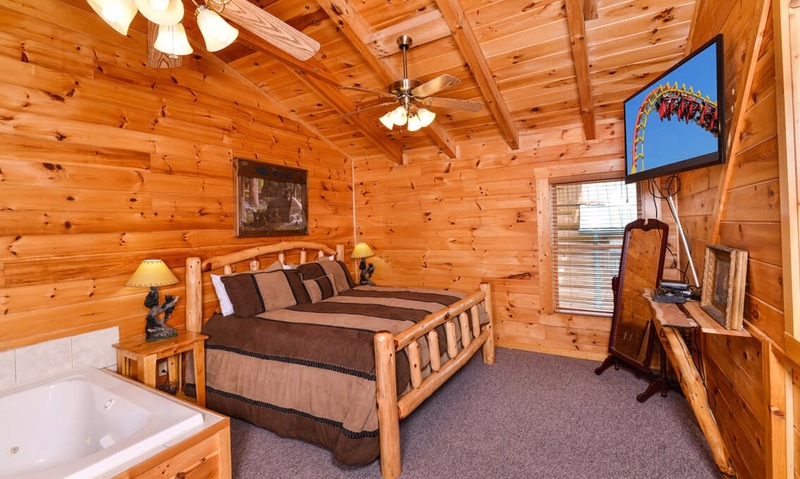 "The cabin was clean and comfortable. The host was very responsive."